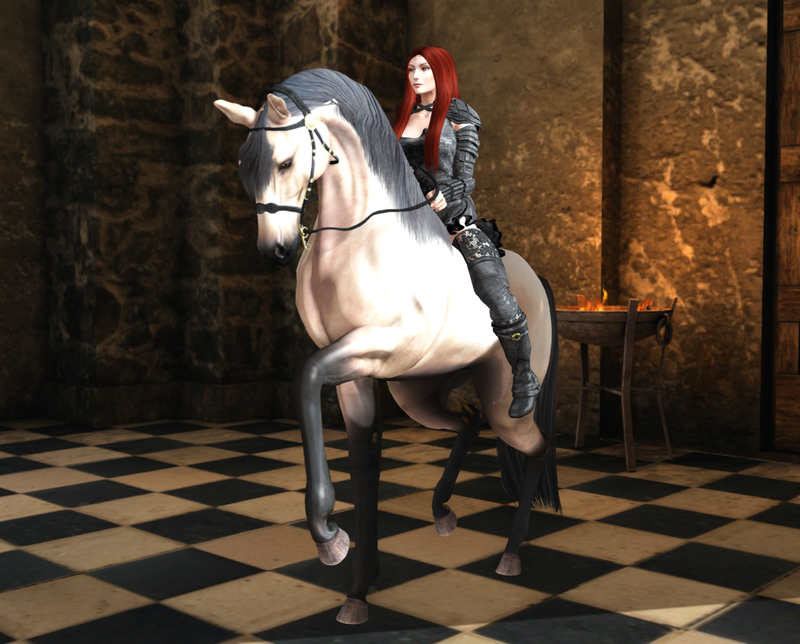 The Ice and Fire event opens on April 3rd and of course I will be blogging it. Even though we’re already starting to get crazy busy now that the start of season 8 is less than two weeks away, I wouldn’t want to miss the opportunity to have fun drawing some inspiration from Westeros for a few posts. After all, I have bought all these castles and medieval buildings for a reason! First up is a beautiful gown that is a collaboration between Faida and Velvet Whip together with one of a set of six pendants by Adam n Eve. 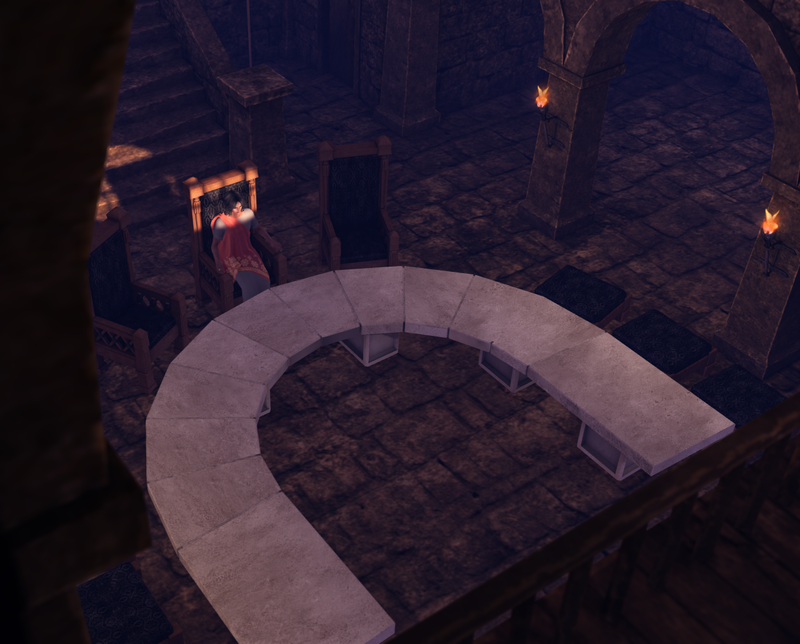 For the background, I decided to setup my Iron Throne from Death Row Designs in the Dungan Castle by Fanatik. Not quite the Red Keep, but pretty good! I could have used some dragon skulls for the walls, though. When Fanatik came out with their river set, I wished for a waterfall in my post about it. I don’t know if that had anything to do with it, but a week or so ago they released a matching waterfall. Naturally, I had to pick it up, though it took me a while to get around to featuring it in a post. But when I wanted to do a dreamy forest scene to feature Faida’s and Velvet Whip’s collaboration for Enchantment, the waterfall turned out to be the perfect backdrop when set at the edge of the forest from Studio Skye. I am also teasing another of the new Adam n Eve skins that will be out at Skin Fair 2019 and the gorgeous hair is by Wasabi. I had thought of doing something more New Year’s inspired, but then I went shopping at Fanatik yesterday as they announced a big sale and ended up stuck doing some landscaping around one of my castles instead. That also seemed like a very good bit of scenery for showing off one of Senzafine’s recent gowns and letting you know that Senzafine and the Muses have had to more their mainstores. Senzafine has also put on a sale in conjunction with the move. All details about the two sales and the move below, plus a brief look at the newest gacha hair from Analog Dog. Without any help from cute cartoon animals, this Cinderella has to sort out a gown for the ball on her own. I just love the kind of scenes you can setup with well-made roleplay props and some of the best definitely come from Roawenwood. The latest set is out at We Love Role-Play and offers not only a few different work animations but also options for rezzing different in-progress garments on the dummy. The top and skirt seen here is one such option, the dress shown in the background another. I promised you would be seeing more of the new castle from Fanatik, so here is a view by one of the windows. I really like the wistfulness created by someone gazing out a window like this and I thought it made for a nice contrast with the fiery textures of the new gown from Senzafine for We Love Role-Play. I also added in a further light source in the shape of a brazier from Fantavatar & Moonstruck, also from We Love Role-Play. Which reminds me, there’s a few things I would love to see in terms of decor for medieval houses and castles. Number one on that list? Rushes for covering the floors, that would give a great, rustic look. Storage chests are another nice decor item that is great for filling out a room a bit with. 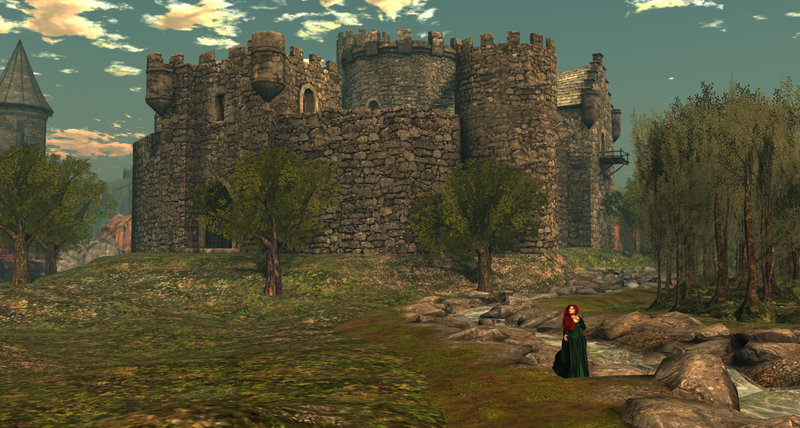 I have a thing for castles, which meant that when Fanatik announced their latest release, the Dungan Castle, I pretty much knew I would have to get it even before I checked it out. I have already had plenty of mileage as far as photos goes from their previous castle, the Arkaig Castle, and the new one looked sufficiently different that I felt it would be a great addition to the photo locations on our sim. To give a sense of what it is like, I have done a video walk-through. Expect to see more of it in photos in the coming weeks! Just the other day I had reason to discuss the use of green as a colour to indicate the presence of magic, so it seemed fitting that I would make use of it here as I am showing off the latest fantastical gacha from the Plastik: Spidela. I have mentioned before what I think about spiders—and about having them all over my avatar!—but this is a pretty darn nifty set. It is very sword & sorcery, Spidela could have stepped right out of a Conan comic, and I think it went very well with this Necromancy pose & prop set from chanimations, an old favourite of mine. I also made use of the Petra Chamber add-on for Fanatik’s cave system as the backdrop for a suitably ancient and epic feel. It is time for We Love Role-Play again, so it was particularly appropriate that I ended up using the Roleplay HUD from Mythril to stage this scene. I have had so much use of it since the Fantasy Faire that I cannot recommend it enough to anyone who takes more story focused shots as opposed to modelling shots. In this case, the story is one of a woman looking out over the sea from high up in a castle, waiting for a ship that does not arrive. The new items featured are from Senzafine, lassitude & ennui and Wasabi. Pure home & garden posts are fairly rare for me, usually I want to work in an avatar somewhere in the shot. But it can be detrimental to actually showing off larger pieces of landscaping or, as in this case, a whole building. So, when I couldn’t settle on the right look for my avatar or how to compose the shot with in avatar included, I decided to let the landscaping be the sole focus. 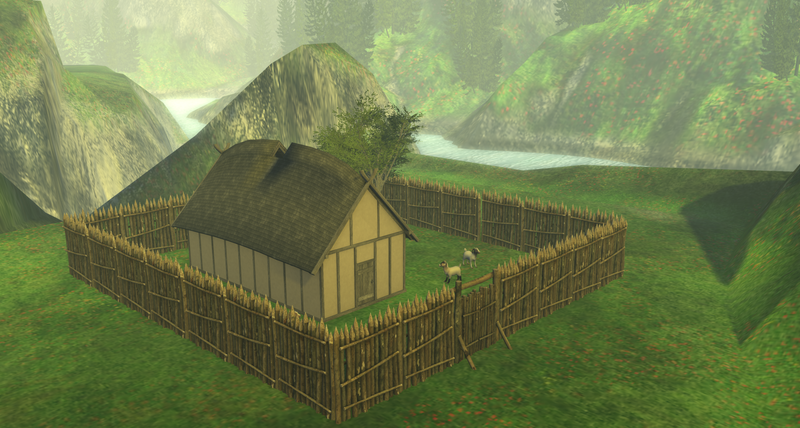 The new release featured here is the Small Longhouse from the Dreaming Thicket, with additional decor pieces from Fanatik, the Little Branch and Jian (if the goats will forgive me for being called decor). A couple of days ago we jumped ahead into summer with temperatures that made sitting at the computer a low priority. Today is a little cooler, enough that I was inspired to do some photos again. This set features a mix of fantasy items items from the Fantasy Gacha Carnival and We Love Role-Play, plus an amazing hair from Stealthic that will be out on the 15th at Kustom9. I headed down into my caves from Fanatik again for the perfect surroundings, and added a touch of magic with these eerie swirls from the Plastik. I also got some more mileage out of the Mythril Role-Play HUD for putting together these pose combinations. The new round of We Love Role-Play made a bit of a dent in my virtual wallet as there are some very nice pieces available. 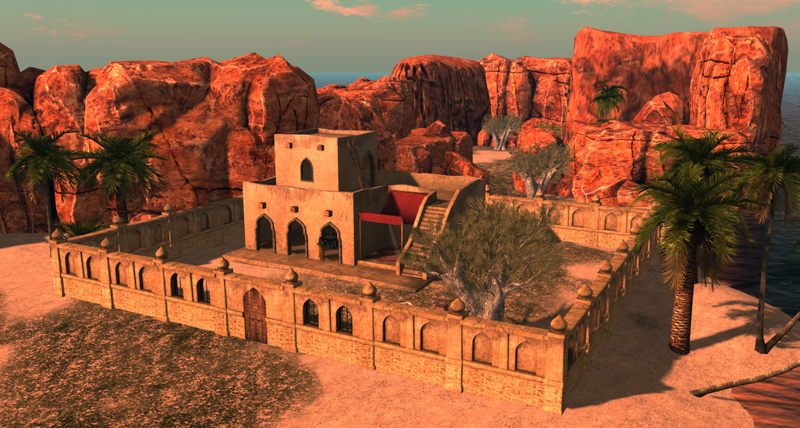 In particular, I just had to have the Desert Villa and Desert Wall Kit from LORE, perfect for building a little retreat in the desert area of the sim. The red cliffs are of course done using Fanatik’s Lofoten set and the palm trees are a new release from Fanatik with 11 different tree models. The dress is also a We Love Role-Play release, from Dreaming Thicket, and the hair is Wasabi’s latest release.